It's Navrathri and I am sure almost every household, specially in south India is searching for Sundal Recipes online. Sundal is nothing but seasoned legumes that are specially done as prasad during the Navrathri. We have a tradition of keeping Golu or sometimes called Kolu. It's the placing of dolls in steps and worshipping them for nine days. The main deity in the doll step is the Marapaachi bommai. A couple made of wood carving. A fruit especially pomegranate is placed in the front of the bommai and daily pooja is done morning and evening and Sundal is offered as prasad. During these nine days, generally girls/ladies are invited and are showered with return gifts or goodies that includes sweet, sundal, bangles, bindhi and other items generally used by the ladies/girls. Goddess Durga, Goddess Lakshmi and Goddess Saraswathi are worshipped during Navrathri. I have made an attempt to do nine varieties sundal this year for the nine days of this festival. I have already posted channa sundal. 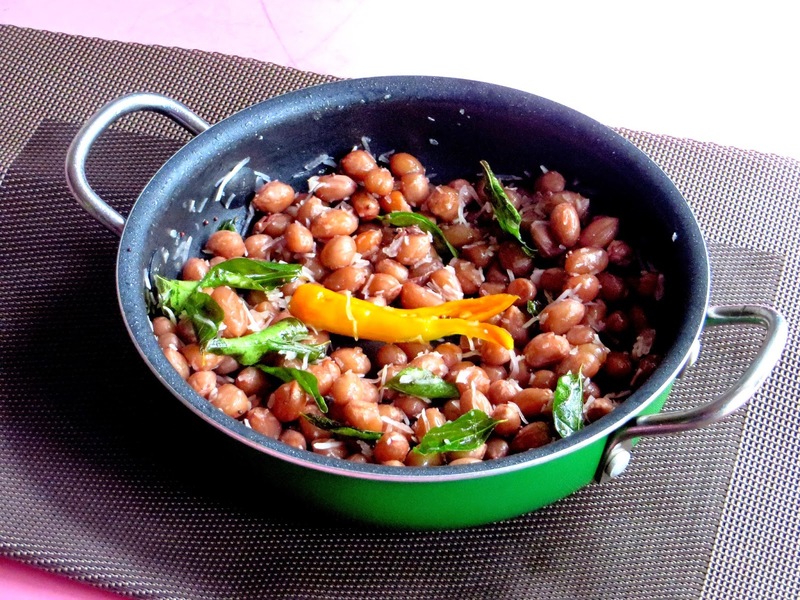 Here is the recipe for groundnut or peanut sundal. Water to boil the groundnut. Raw shelled peanuts are used in this recipe. Wash the peanuts and soak for 10 to 15 mintes. Heat a pot of water and add salt - atleast 3 teapsoons. When it comes to a boil, add the peanuts and cook. Alternatively, the peanuts can be pressure cooked in salted water for 5 to 6 whistles. Drain water and keep the cooked peanuts aside. Now heat oil in a small kadai. Temper the mustard seeds. Add curry leaves and green chilli. Fry for few seconds and add peanuts. Sprinkle salt as the peanuts are already cooked in salted water. Garnish with dessicated coconut or fresh grated coconut. Stir well and its ready to serve. It makes a very good evening after school snack as peanuts are loaded with nutrition for children. If whole peanuts that are not shelled are used, wash the peanuts and pressure cook them in salted water and then shell them. That way its easy to take the peanuts out. Then, follow the same recipe. When pressure cooking, use a little more salt than specified in the recipe.